This was of course our annual date with The Warriors courtesy of The Mad Butcher at the Huapai Golf Course. 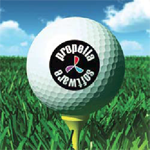 Thanks to Lance, Propella golf balls are now enjoying an advertising position all over Huapai. Gotta say though, Lance showed talent that Ian 'Haggis' Henderson could only dream of. We did miss you Hendo – let's just leave it at that. This year Propella Software sponsors The League Hour with Alan Mack on Radio Sport. Clients attending our next User Group meeting will go into the draw to join us in the Radio Sport corporate box later in the season.